If I offered you free food- say, a shopping bag full every week- would you take it? If it’s food that you would normally buy, food that’s healthy and fresh? That’s what you get if you can eliminate food waste. Americans waste an average of 20 pounds1 of food per month for every person. 20 pounds! If we can learn to plan well, cook right, store properly and use completely, that’s 20 pounds of food per month that an average person will get back, free of charge. Here’s how to do it. Go through your cupboards, fridge and freezer and plan as many meals for the week using ingredients you already have. Then, decide what meals and snacks you need for the rest of the week. This stops double ups and unneeded items. No impulse buys, no added extras. You won’t need them if you’ve planned your meals properly. No point buying a fortnight’s supply of lettuce if it’s going to be inedible in five days. Go through the fridge, freezer and pantry when you write your shopping lists at the start of the week and pull anything that’s close to expiry to the front, so you remember to use it first. Salad veg, spinach and bananas go bad faster than potatoes and apples, so save hardier vegetables to use towards the end of your shopping cycle. If you aren’t completely certain you’ll use that meat in a day or so, pop it straight in the freezer. Don’t leave it out for convenience if there’s a chance you’ll forget to use it. Look up the correct way to store your fresh foods and chop, wrap or package everything properly as soon as you get home for optimal shelf life. Instead of leaving them out or piling them into a container that will sit at the back of the fridge, pack your leftovers in single serve or family dinner sized portions and freeze immediately. Label and date them and make sure you incorporate them into your meal plans for the next week. Broccoli stalks are great in coleslaw, corn cobs can be added to stock and carrot or celery tops make great salad or stock ingredients. Milk and cream approaching the use by date can be made into yoghurt, cheese and butter, or just frozen if you have too much. Save stale bread, chips and cornflakes for crumbs and blend herbs with butter then freeze for delicious pesto. As soon as things start to turn, throw them in the freezer. Defrosted, they can be thrown into a pot with a little apple cider vinegar or white wine, along with some bones (raw or cooked) to make a hearty stock or broth. Most people know you can throw vegetable scraps in to the compost, but some vegetables can be regrown from the bit you don’t use. Pineapple tops, carrot tops, sweet potatoes, ginger knobs, shooting garlic and so many more can be replanted and grown into whole new plants. You can also save the seeds of some things to grow. 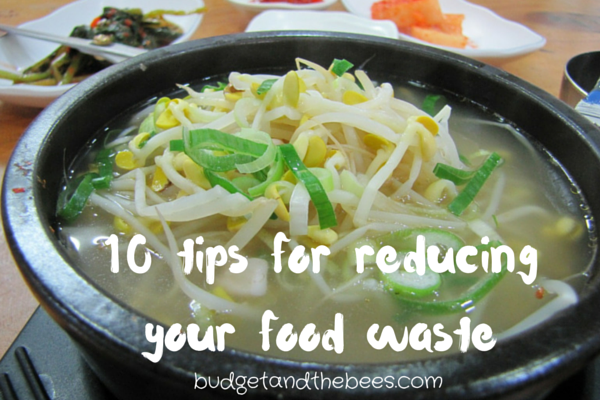 Meal planning definitely can reduce food waste. Aside from this, my wife buys exactly what our family needs, practice first in first out or FIFO, and donate what we won’t use to others, this rarely happens. These some of the practice we do at home to reduce or avoid food waste.